Down 0-1 in the NLDS. Backs against the preverbial wall. A fan base on the edge, ready to jump. This is why Jim Hendry and the Tribune Co. shelled out more than $90 million to keep Carlos Zambrano in Cubbie blue. When Big Z trots out to the Wrigley Field mound tonight, the focus of Cubdom shifts squarely on the $91.5 million dollar man and the right arm that has brought joy and pain this season. 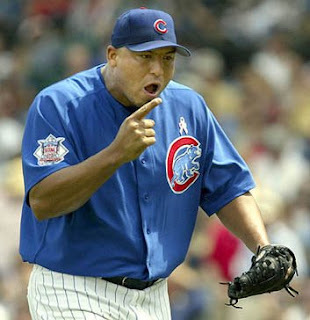 The question at hand is which Zambrano will show up at the Friendly Confines tonight? Will it be Carlos Zambrano-no, who in 14-wins has 76 punchouts and a 1.53 ERA? Or will it be El Toro Loco, who posted a 10.53 ERA in six losses this season. While the bandwagoners are jumping ship, continually awaiting doom, I will still have faith in the Cubs going into Los Angeles. In Game 3, the North Siders will have Rich Harden, who went 5-1 with a 1.77 ERA since joining the team in July. He's not CC Sabathia, but he's been just as dominant at times, striking out 89 batters in 71 innings in the familiar blue pinstripes. Ted Lilly would take the bump in Game 4, unless the Dodgers pull of the unlikely sweep. Teddy Neversmile has been the Cubs' best pitcher down the stretch, and though he's prone to giving up the long ball, pitching in pitchers paradise Dodger Stadium lightens the load Lilly would have to carry. Cubs fans: it's not over. It's not even close to being over. It's not time to be praying for a miracle. This ain't your daddy's or granddaddy's or great-granddaddy's Cubs. This ain't your 1909-2007 Cubs. This is 2008. This is the team. This is the year.